Explore the beautiful grounds of Belle Meade Plantation on this self-guided tour. This self-guided experience includes access to Belle Meade’s many historic buildings on the plantation grounds including a dairy, horse stable, carriage house, mausoleum, gardens, and a log cabin. At the end of your journey you can sit back and enjoy a free wine tasting at our winery for the complete experience. This DOES NOT include a guided tour of the mansion. Arrive at Belle Meade Plantation and explore the magnificent grounds that surround this incredibly historic mansion. Covering 30 acres, the plantation grounds has 10 outbuildings scattered throughout the estate, an amazingly reconstructed two-room slave cabin, a tiny 1870's children’s playhouse that was used by the Harding children. There is also an 1884 dairy that supplied fresh milk, cream, and cheese and produced up to 240 pounds of butter each week, as well as an 1826 smokehouse which is the largest in the South. This smoke house smoked up to 20,000 pounds of pork each year and is a sight to see. 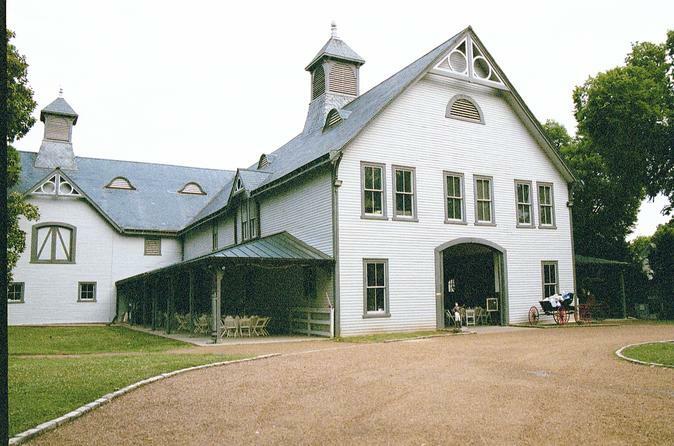 There is also the large carriage house and stables, built in 1892 that showcases the Harding and Jackson family's carriage collection, which is similar to a car collection today. This self-guided tour will take you on a journey back in time to the 1800's and will provide you with an experience that will allow you see what it may have been like to grow up in that time. Once this journey is over, you will be able to treat yourself to a free wine tasting at our winery and sample Tennessee red and white wines made from the native southern grape and blackberry fruit. This DOES NOT give you access into the mansion.